"Music of the Highest Caliber"
"Exceptional performance,exotic and sensual..his music transports the soul." 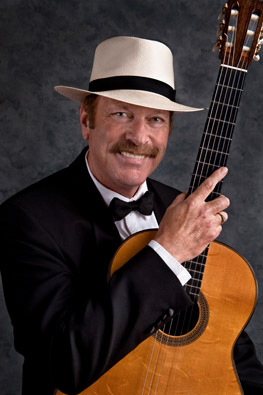 Classical guitarist Terrence Farrell's stylish, elegant and forceful performances and recordings have earned him national and international acclaim. Born in Salzburg, Austria, Mr. Farrell began studying the guitar at the age of eight and eventually became the protégé of American guitarist Guy Horn. He has won a Grammy nomination, and awards and competitions from the National Endowment for the Arts, University of Washington, the Palm Springs Opera Guild and the Monterey Jazz Festival. His musicianship has been praised for the eloquent versatility with which it moves from Classical to Romantic to the most demanding contemporary compositions. The ease with which Mr. Farrell establishes a friendly, conversational rapport with his audiences has made his concerts very popular. As a result, he has been invited to play in forty-eight states and thirty-four countries around the world, from North America to Europe and the Far East. He has twice performed for American presidents and, as a cultural ambassador, presented American music overseas for the U.S. State Department. He was a featured performer on Royal Viking and Seabourn cruise lines and on a world cruise of the QEII. The friendliness of Mr. Farrell's approach, along with his ability to translate complex musical ideas into verbal concepts, has created a great demand for his master classes and seminars, conducted in Europe, Asia and the United States. For years he directed the International Guitar Seminars in Bavaria. Terrence Farrell recordings for Orion and Troubadour Recordings are listed below. Travels with my Spanish Guitar is a compilation of 14 compositions he wrote inspired by his world travels. 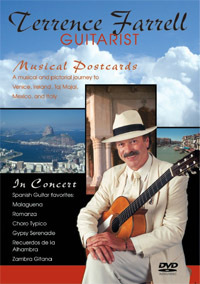 Terrence Farrell - Guitarist, a DVD, features a pictorial journey around the world with his photographs and musical renditions. He published World's Favorites for the Acoustic Guitar music book with CD. 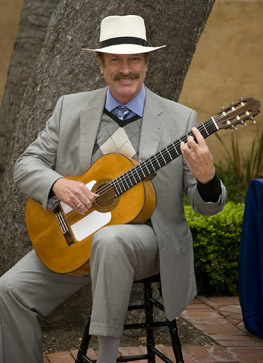 Terrence's performance of his composition Gypsy Serenade is featured on an audio tour of Big Sur, California narrated by Clint Eastwood. Terrence recorded for the Yehudi Menuhin Foundation. He played a concert with the Mother Lode Opera Troupe at the Robert Mondavi Winery, and later recorded with them. At the Lodge in Pebble Beach, in 2000, he was invited to perform at the ceremony honoring all living winners of the US Open. Terrence was the lead guitarist in the musical Man of La Mancha, produced by Pac Rep Theatre, in which he collaborated to distill a whole orchestra down to two guitars. For the Carmel Bach Festival he performed Mexican Baroque music on a Baroque guitar at the Carmel Mission. He enjoys accompanying the renowned Spanish Flamenco dancer Alicia Morena di Palma. 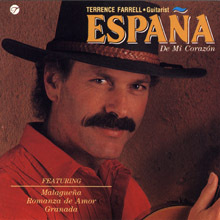 You can learn more about Terrence Farrell's CD's and DVD and order them online at TerrenceFarrell.com.